The European Commission has opened an in-depth investigation to examine whether tax rulings granted by the Netherlands to Nike may have given the company an unfair advantage over its competitors, in breach of EU State aid rules. Nike is a US based company involved worldwide in the design, marketing and manufacturing of footwear, clothing, equipment and accessories, in particular in the sports area. The formal investigation concerns the tax treatment in the Netherlands of two Nike group companies based in the Netherlands, Nike European Operations Netherlands BV and Converse Netherlands BV. These two operating companies develop, market and record the sales of Nike and Converse products in Europe, the Middle East and Africa (the EMEA region). Nike European Operations Netherlands BV and Converse Netherlands BV obtained licenses to use intellectual property rights relating to, respectively, Nike and Converse products in the EMEA region. The two companies obtained the licenses, in return for a tax-deductible royalty payment, from two Nike group entities, which are currently Dutch entities that are “transparent” for tax purposes (i.e., not taxable in the Netherlands).The Nike group’s corporate structure itself is outside the remit of EU State aid rules. As a result of the rulings, Nike European Operations Netherlands BV and Converse Netherlands BV are only taxed in the Netherlands on a limited operating margin based on sales. At this stage, the Commission is concerned that the royalty payments endorsed by the rulings may not reflect economic reality. They appear to be higher than what independent companies negotiating on market terms would have agreed between themselves in accordancewith the arm’s length principle. Nike European Operations Netherlands BV and Converse Netherlands BV have more than 1,000 employees and are involved in the development, management and exploitation of the intellectual property. For example, Nike European Operations Netherlands BV actively advertises and promotes Nike products in the EMEA region, and bears its own costs for the associated marketing and sales activities. In contrast, the recipients of the royalty are Nike group entities that have no employees and do not carry out any economic activity. 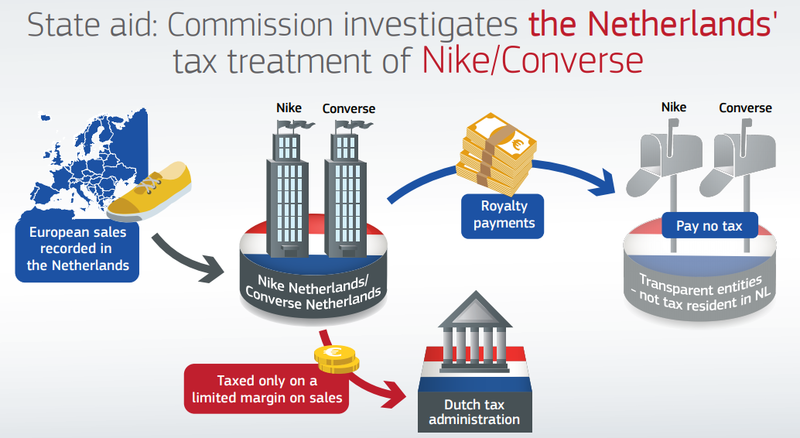 The Commission investigation will focus on whether the Netherlands’ tax rulings endorsing these royalty payments may have unduly reduced the taxable base in the Netherlands of Nike European Operations Netherlands BV and Converse Netherlands BV since 2006. As a result, the Netherlands may have granted a selective advantage to the Nike group by allowing it to pay less tax than other stand-alone or group companies whose transactions are priced in accordance with market terms. If confirmed, this would amount to illegal State aid. …it is not established that the Luxembourg tax authorities misapplied the Luxembourg – US double taxation treaty. Therefore, on the basis of the doubts raised in the Opening Decision and taking into account its definition of the reference system, the Commission cannot establish that the contested rulings granted a selective advantage to McD Europe by misapplying the Luxembourg – US double taxation treaty.